With spring officially in the air here in Soldotna, AK, we’re eagerly preparing for the upcoming summertime fishing season here at All Alaska Outdoors Lodge. 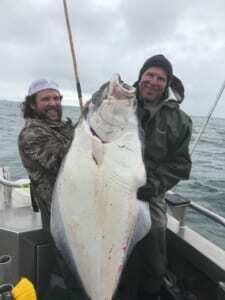 While we’re primarily known as a world-class Alaska fishing lodge, we offer so much more than salmon fishing adventures. The professional, well-traveled staff here at All Alaska is passionate about ecotourism, health and wellness, hunting, and, yes, fishing! 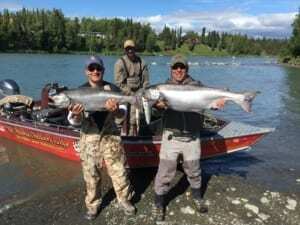 We set ourselves apart from all other Alaska fly fishing lodges by providing once-in-a-lifetime wilderness excursions, including bear viewing, river rafting, flightseeing, ptarmigan hunting, and, everyone’s favorite, Kenai River salmon fishing. Tasty, Nutritious Salmon: Salmon is the best source of protein on the planet. According to Dr. Ledda, salmon has “high levels of omega-3 fatty acids, astaxanthin, (a potent antioxidant that gives salmon its red color) and lots of protein.” And there’s nothing quite like fresh-caught Kenai River salmon! Relieve Stress: Time spent outdoors is a great way to relieve the stress of our hectic lives, and Alaska is the “Great Outdoors” after all. Lengthy Days: Summer days in Alaska are excessively long, so, you can enjoy much more bang for your vacation dollar! The sun rises around 4:34 a.m. and sets at approximately 11:39 p.m. on June 21st. Heck, it won’t even get dark for almost a month. Wildlife Viewing: We’re one of the only Alaska fly fishing lodges that also provides world-class guided wildlife viewing. You’ll have the rare opportunity to witness bears, moose, eagles, and so many more magical beasts during your dream vacation. It beats a trip to the zoo, hands down! Active Volcanoes and Glaciers: Where else in the world can you witness an active volcano right next to a glacier? The Last Frontier is genuinely jaw-dropping! Special Wellness Week: Combine your week in Alaskan heaven with a Cenegenics Elite Health Evaluation during Wellness Week. At the end of the week, Dr. Ledda will have specialized insight into your unique disease risks and predispositions. Dr. Ledda will also help design a lifestyle personalized for your preventive care. Discounts: Parties of eight or more as well as active and retired military members receive ten percent off! We also offer several Alaska fishing trip packages on our specials page. You’ll Return Home Happy: By relieving stress, reeling in trophy fish, catching up on sleep (ha!ha!-good luck), and visiting some of the most beautiful places in Alaska, you’ll return home happier than you ever thought was possible. These are just ten of the reasons why we’re one of the top-rated Alaska fly fishing lodges on the Kenai Peninsula. To learn more, please visit us online at AllAlaska.com, or give us a call today at 1-907-953-0186.